IDC Coin & Bullion address, phone, website, and more. Coins and bullion are popular among collectors and investors alike, and at IDC Coin & Bullion, we’re happy to serve customers looking to buy gold, silver, and other precious metals for both numismatic and investment purposes. We have more than 30 years of experience and are the premier coin and bullion dealers serving the Tampa Bay, Orlando, and Savannah areas. 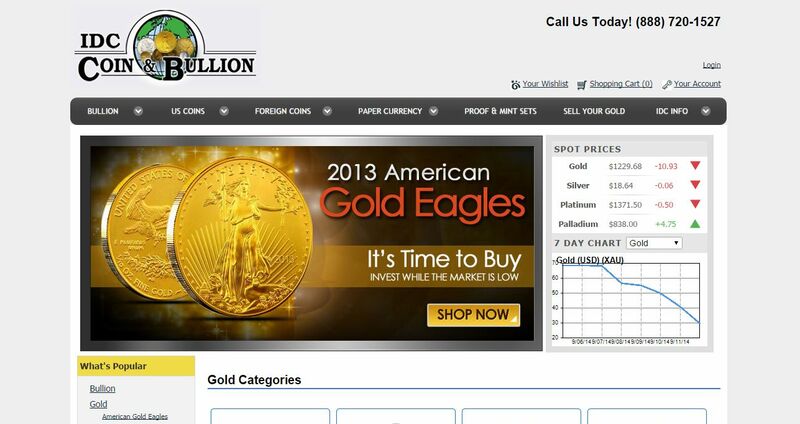 We boast a comprehensive inventory that includes US gold and silver coins, foreign coins, gold bars, and silver bars, plus platinum and palladium bullion. We offer a selection of gold coins that is especially impressivewith an incredible array of pre-1933 coins that includes Gold Eagles, American Gold Buffalos, and more. For customers who would like to buy silver coins, we are proud to offer an extensive inventory of slabbed and graded silver dollars, American Silver Eagles, and other silver US coins. We also carry gold and silver Credit/Pamp Suisse bars, Johnson Matthey and Englehard bars. Plus, all of our coins, bars, and other bullion pieces are competitively priced with low premiums over spot, so you can be sure you’re getting an outstanding value.